The UCLA Bruin football team begins its season in less than a week. This is exciting! This is one of the reasons why you came to UCLA! “Wait,” you say. “I actually chose this school because of its academics and social atmosphere – I couldn’t care less about sports.” Sports might not be everyone’s highest priority, but one can’t help but pay a little bit of attention when news of the Bruins’ clutch victories and narrow defeats are always the talk of the campus. Regardless of personal interest, sports are a big deal. New and returning students alike may find social situations where you’re compelled, for one reason or another, to talk about football. Before Saturday’s game against Virginia, here’s what you need to know about UCLA football so you can sound like an expert this season, even if you know nothing about sports and have never touched a football. Rosen, a greater L.A. native, generated more social media buzz than usual when coach Jim Mora named him the team’s starting quarterback Wednesday. It’s no surprise that the quarterback is the subject of the most intense speculation and commentary – a good quarterback is the linchpin of any decent team, since they are the team strategist and captain. He also fills the shoes of Brett Hundley, who left UCLA early—as is typical for top talent—to play in the NFL. Both are immensely skilled players, although Rosen is more of a passer and Hundley, a runner, if we want to simplify things. 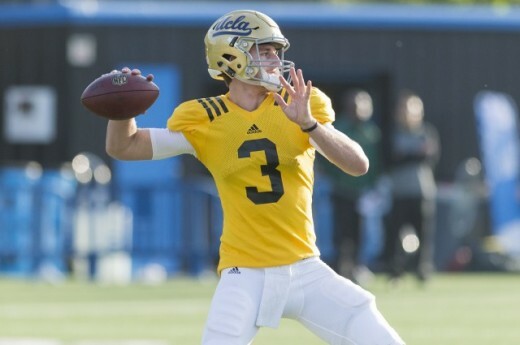 People have been, and will be, talking about Rosen for two reasons. First is the fact that he is a true freshman – a new student playing on his first year of eligibility with no prior exposure to the team. This has been a cause for some concern, especially as he was chosen over redshirt junior Jerry Neuheisel, even if he is a middling player by most accounts. Rosen’s second claim to relevance allays these concerns – he is really, really good. Depending on who you ask, he is the No. 2 or No. 1 quarterback to come out of high school in the class of 2015. Much of the coverage has been congratulatory or hopeful, with some reporters suggesting that he could finally push the team over the edge and transform the Bruins’ recent successes into a division or conference championship. Call it the two-point conversion the team needs. Rosen is even a football player you might want to talk to off the field – and not about football. Though technically a freshman, he started college this Winter quarter, essentially leaving high school half a year early to become acclimated with campus life and academics. He boasts a 4.3 high school GPA, which is very close to the entering freshman average – and most of us don’t have to balance grades with hours of practice a day. Quarterbacks are important, but don’t have a job if they don’t have a receiver to catch a pass or offensive players that give them the chance to throw the ball in the first place. Other players deserve some attention as well. Myles Jack is one of those players. The junior, who is starting for his second year now, is one of the Bruins’ top linebackers – in other words, a player who huddles near the line of scrimmage and stops opponents who are trying to move the ball or catch it from afar. A real rarity, Jack can play offense, too, as a running back – a key ingredient in those exciting highlight reel plays where a player magically emerges past the chaos near the line to rush or score. He also is uniquely engaged with student government. Freshman Sotonye “Soso” Jamabo is another promising RB, and he has a real sense of humor. The more experienced redshirt junior Paul Perkins is considered the best in the conference. Wide receivers are also important people to keep an eye out for – if the camera can pan to them fast enough. They’re some of the fastest players on the team, with just enough pounds on them to shrug off tackle attempts as they catch far-flung QB passes. Junior Eldridge Massington has impressed with some surprising plays. During the UCLA flood caused by a water main break last year, he had a brief stint with watersport. All this talk about players, but all you want to know is: “Are the Bruins any good this year? Otherwise I’ll just find something better to watch.” The hype that was around last year has been tempered by quarterback uncertainties, which means there’s less pressure on the team. Still, expect the Bruins to win most its games – my arbitrary prediction is 10-2 overall. Top national predictions place the Bruins at around No. 13. The catch is that UCLA competes at one of the most competitive conferences in the country. Stanford (Oct. 15): Even the uninitiated know that the real rivalry is between Stanford and UC Berkeley. But the Cardinal have dashed championship hopes by defeating UCLA for the last six years. A losing streak ought to not outlast the Great Recession. California (Oct. 22): A feel-good match, in case Stanford extends its buzzkill reputation, with our academic rival being played at home – and the only other UC school in the Pac-12. USC (Nov. 28): This inclusion seems self-explanatory. But while UCLA won the last three crosstown matchups, that history won’t predict the outcome of the regular season closer as USC recovers from crippling sanctions imposed by the NCAA. In fact, the media predicted that USC will come out on top of the conference. Can the Bruins upset the predictions – and more importantly, the Trojans?